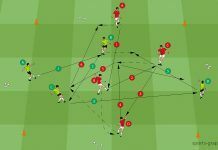 Organization: In a field (12mx24m) is being played 4 v 4 plus 3 neutral players with the aim to hold the ball as long as possible. One neutral player is situated in the field, while the two others occupy the short sides. If the ball leaves the field, the coach introduces a new ball. Coaching: Red tries to hold own ball possession as long as possible. If one of the outside-players is in ball possession, A and B position widely. If now the neutral player B positions in the center (as a center midfielder), the blue players will be moved as much out of the compound that the gap pass is possible to play. If the center is covered, it could be opened over A or B. During the further play, the quality of B is demanded, who could be attacked from all directions in the center. To keep calm and to head for a free passing option characterizes this player. Blue defends in a numerical disadvantage. 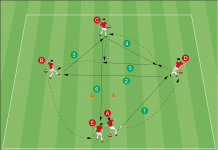 The first defensive line A and B mirror two forwards, who need to defend against a superior number of players (as for example a back line of 3 or 4 players). They intercept passes through the center and direct the attacks over the wing-positions. A gain of the ball is on the positions C and D realistic. 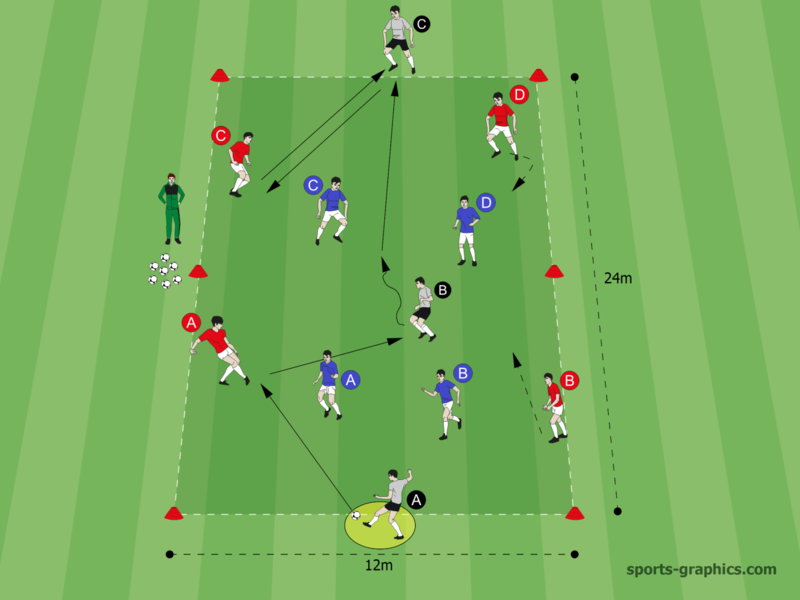 C and D are in expectation to interfere passes to C and D. Trained is the optimal distance to the potentially passed to opponent. C and D shall neither stand to close (their opponent would not be passed to), nor too far apart (they would not be able to enter a duel). 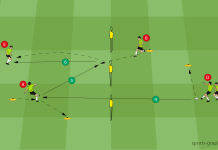 Variation: Introduce limits of touches (vary level/increase or decrease pace). Players A to D of the possessing team occupy respectively one position out-side the field between the marks. 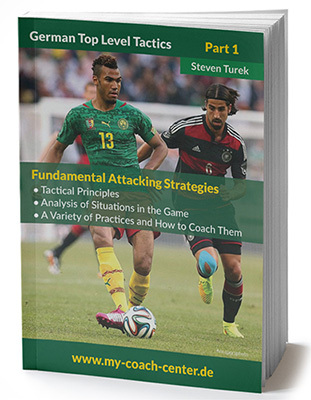 The first part of the new ebook series “German Top Level Tactics” by Steven Turek and Ralf Peters deals with specific attacking strategies to improve the tactical knowledge of your team. 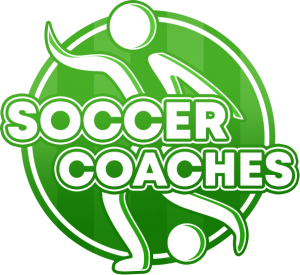 It gives detailed information on how to efficiently open and use space against deeply defending opponents and provides concrete solutions for the build-up!